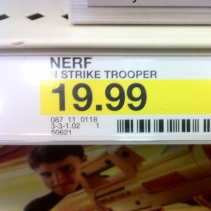 I’ve heard there’s still some discrepancy as to whether or not the Alpha trooper is still available in stores. And I happened to stumble across a bit of proof to debunk those fears. 🙂 While job hunting today, I spotted three Alpha Troopers perched merrily on the shelf in Target’s Nerf section. Looks to me like the ol’ AT is around to stay. Pictures were taken from mah iPhone. You know those guys that say “You’ll never be one of the last humans”? Yeah, screw those guys. You’re awesome, and this is how you’re gonna prove it! Right then! So you wanna be a foam-flingin’ super saiyan slaiyin’ badarse of a human? 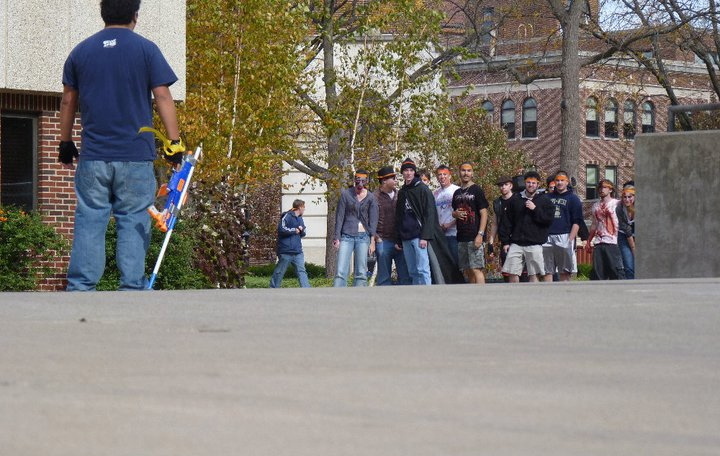 You wanna be recognized cross-campus as “that guy!” and take on hordes of undead single handedly? Well you’re in the right place. This post is dedicated to what it means to be a great human. So read on, and git yo’ learnin’ on! This rule pretty much explains itself. The better out-of-the-box weapon you have, the better off you will be. Which would you rather have: A 6 shot (fairly regularly jamming) Maverick, or a 35 round slam fire Raider? Also, have a backup! 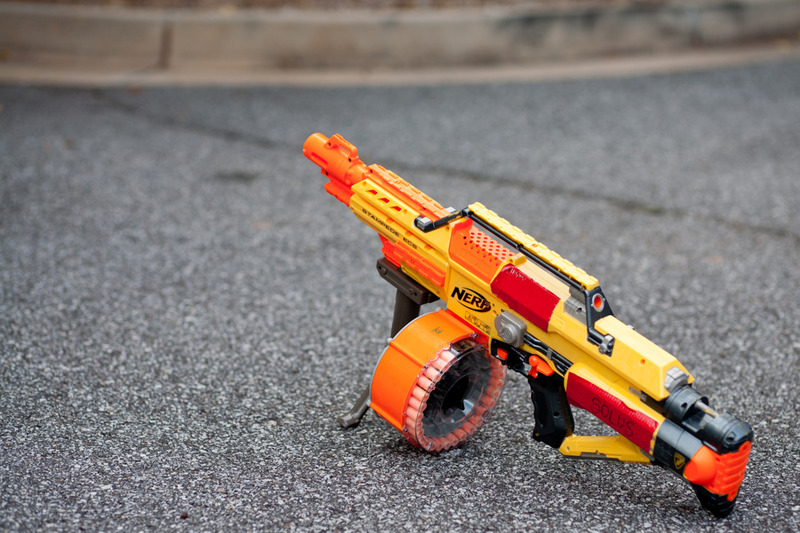 Whether it’s another blaster or a wad of marshmallows, don’t let your primary blaster be your only anti-zombie device. Because the second the undead hear the “clink!” of an empty dart chamber, it’s buffet time at Uncle Zed’s Barbecue, and you’re on the menu. Have you ever heard the expression “Your weapon is an extension of your body”? It’s an old warrior monk saying, and you would do well to listen to their advice. The better you know your weapon of choice, whether it’s a bolt action, shotgun-pump, automatic, or melee weapon (or anything else) the better your odds are of survival. You should get comfortable with it before the game starts. That means getting used to holding it, getting used to the trigger strength (how far you have to pull the trigger to make it fire) and even multiple ways of holding it and firing it case you drop it and are in a scramble. Also learning how to fire it as fast as possible without making it jam will be crucial. A good rule of thumb is that you should be able to reload, fully operate, disassemble & reassemble your blaster in the dark. Know thine blaster *insert pirate accent* and ye may yet live ter see another day! YAARRRR! Rock it like this guy. A cool head and a great blaster can make a loooot of intimidation. Rule # 5 – Strategy Strategy STRATEGY!! This is by far the most important rule of the lot. Any given human can be tough, but a group of humans (all calm, collected, and well equipped) can be nigh impenetrable. 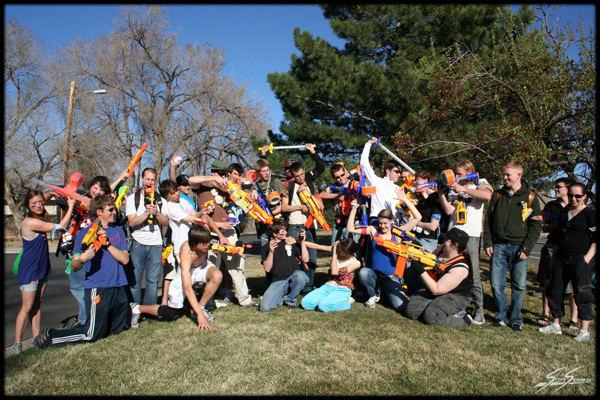 below are some of the most effective strategies you should employ in HvZ, along with one you shouldn’t. This is the simplest tactic there is, and is used when your group is rushed by a group of zombies. All humans line up shoulder-to-shoulder and bear down on the enemy. It is best executed in the same style archers would use in the middle ages. First, all blasters are fired at the same time, this creates what is known as a “wall of foam” blast that usually stuns the entire first, and sometimes second, row of zombies. This first launch should be sent when zombies reach the 15 – 25 foot mark (15 – 25 feet away from you). After this, it’s a free for all fire-at-will. That means that anyone can fire at whatever zombie they want, whenever they want. These fire-at-wills last until the end of the rush. Here you can see a human squad easily taking out 9 zombies using a double phalanx. There are a few variants to phalanxes, but they’re all easy to understand. Beyond the basic, one layer deep phalanx, you have the double phalanx. This is just like a regular phalanx only two layers deep. The second layer is either directly behind the first, positioned with their blasters pointing out between the shoulders of the first layer, or you can have the first layer crouch down onto their knees. This gives the rear layer a wider turn radius, increasing their chances of hitting their target. This also makes the front row a smaller target for the zombies to tag, but it does reduce their fleeing speed a bit (they have to stand up before they can run away, this may be a life-threatening second they have to spend). It is generally safer to be in the rear layer. You can also incorporate the use of a triple phalanx, the ultimate wall-of-foam generator. This is a three layer deep version, with one crouching layer, and two standing layers with the rear humans aiming between the shoulders of the second row. Any more layers (like a quadruple or quintuple phalanx) and humans would start getting in each others’ way, reducing efficiency. 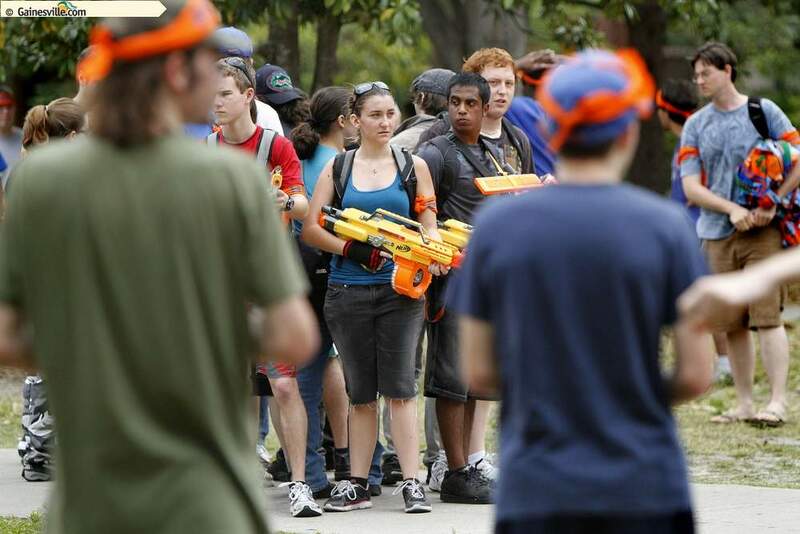 The phalanx is best used for blocking an area from zombie intrusion. The best example would be the stretch between two buildings. A phalanx in the open is okay, but the humans are only defended on one side, which is fine if that’s where all the zombies are. However, at LEAST 1 member should be devoted to watching the rear. If this member spots a zombie trying to sneak in from behind, he can shout and the humans can move into the next formation, the 360. This can also be viewed as a variant of the phalanx. In this version, all members form a circle around a central point. This is sometimes a person, and when it is, it is either a very tall member of the squad or the team leader. Wherever this person moves, the others revolve around him. Depending on the number of humans on the team, the perimeter may be from 5 – 15 feet from the center point. Here is an example of a single layer 360. However each blaster should be pointing directly at one zombie at all times. This is intimidating to zombies. Another option is a double 360. This is where two layers of humans are incorporated, however the outer layer will be crouching. To further the effect, the two layers should be spinning in opposite directions. This will confuse (and intimidate the crap out of) surrounding zombies. This technique makes it to where no zombie has a single target to focus on while preparing for a rush. Instead they see a spinning drill of blasters, very hard to overcome. However, this advanced version of the 360 will only last as long as your outer ring’s legs. Crouching is tough on the thighs, and people tire out quick. Use this advanced version only in severe cases. Finally, remember to NEVER STOP MOVING when in the 360 formation. Your goal is to get out of the “We’re surrounded!” situation and get into a better defensive location. This is like a mini – 360, no more than 5 members. It is best used for transporting several people across an open area or field where no zombies are immediately present, but are known to frequent. This technique is done by having 3 – 5 members travel as a spiraling circle across the open area. This keeps all members on their toes, constantly scanning every direction. Once an enemy is spotted, the other members can be notified using landmarks “zombie by the bell tower”. This is the most complicated formation I currently know, and it uses ranks. It is to be used for large groups of humans (20 -30 members) and can be modified to fit your specific needs. Each member stands between 3 – 6 feet away from their nearest team members. All distances are equal and at 90 degree angles. 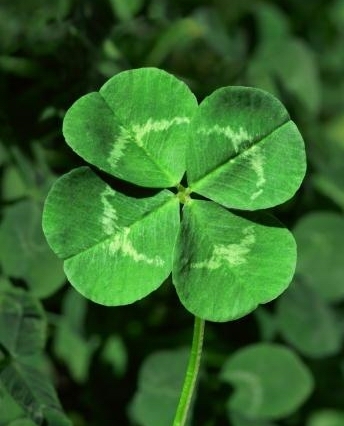 At the heart of the clover lies the Platoon Leader. He focuses 90%+ on what is going on around him, without worrying about where to point his blaster. That job lies with everyone else. The platoon leader watches the battle from the safest position, and directs the team to perform certain acts, such as “move left, forward 50 paces, form into a 360” etc. He makes sure the integrity of the team’s structure is maintained (he makes sure people stand where their supposed to, and makes sure that every person is doing their individual job. That being said, there are only four people that the platoon leader talks to frequently, the Fire Team Leaders. The four Fire Team Leaders surround the Platoon Leader on his front, back, and sides. They are both his personal guards and his connection to the rest of the team. They are the most experienced, calmest, best equipped, and best performing members on the team, short of only the Platoon Leader himself. 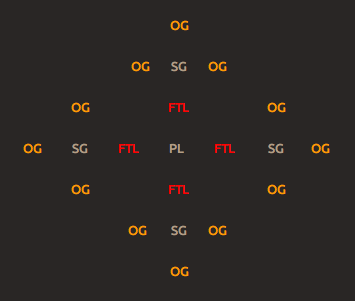 When the PL gives an order, each FTL repeats it to his individual Fire Team. When a member of these fire teams finds new information (such as spotting a zombie) they first tell their own Fire Team Leader and he, in turn, informs the Platoon Leader. The PL then decides how to handle this situation, speaks his decision to the four FTLs, and through them the rest of the team is informed. Support Gunners Stand next to Fire Team Leaders. They are the weakest (meaning most lightly armed, little firepower) and least experienced members of the team. These members often have small, one shot blasters, or blasters that aren’t very reliable. To compensate for this, they often carry large bags of marshmallows or socks, and act as mobile supply crates for their surrounding team members. Their chief role is to keep the Outgunners supplied while still firing a few rounds at zombies as they approach the Outgunners. There are 4 Support Gunners. The last, and most numerous, human type is the Outgunner. They are the individuals with some experience in the game. 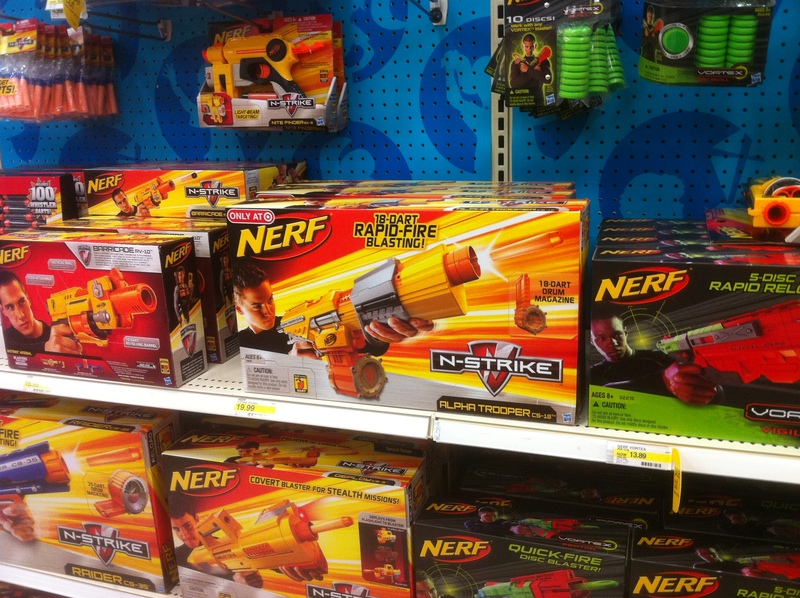 They often have excellent blasters such as Rayvens, Swarmfires, or Stampedes. You will rarely see a single shot or pistol style blaster in the hands of an Outgunner. They surround the Support Gunner on three sides, the FTL is on her fourth. *My personal Support Gunner was a girl with a Maverick. No discrimination intended. Girls rule! Outgunners are usually the first to see, and engage, zombies. They maintain the perimeter and push through the zombie ranks first. There are 12 Outgunners. An aerial (top-down) view of the Clover Formation. This is the WORST formation EVER! It should be called the Death Ball. The Battle Ball is a bit like an angry ant hill. Team members have no definite position and are clustered together in a big wad. Blasters are pointed in every direction, but everyone is in everyone else’s way. This limits mobility severely. It also reduces firepower TREMENDOUSLY. Where you could have 30 blasters facing the rushing horde in a Phalanx formation, you instead have 10, and they’re having to strain to get around the people in their way. 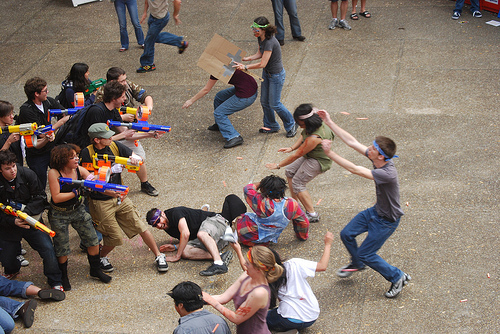 After using this technique against a 100 strong horde on the last day of HvZ, my team of 30 had a 90% casualty loss, leaving only the Platoon Leader, myself (front Fire Team Leader) and an Outgunner left. NEVER use the Battle Ball. Just a few more things to run over. Spiraling. This can be used in any formation (except maybe the 360) while walking. To spiral, you just do a short spin on your feet once every twenty feet of so to do a quick 360 degree check of what’s behind you. If everyone in your group does this you should have a very good perspective of your surroundings. Building hopping. This is just for going to and from class, or grabbing lunch. Grab a campus map and choose the route that places you farthest away from the hub (most active) part of campus while still minimizing the time you actually spend outside. Most buildings are safe zones, remember this. Also, find people with similar schedules as you and building hop together. Humans are always stronger in packs. Well that’s it for now. I’m sure that I’ll come up with some more advice soon, but until then, practice, gear up and get your group together. Good luck human! You CAN be the last human!